This Victorian sample book is from A J Harrison Ltd, a brass foundry once on Bradford Street, Birmingham. 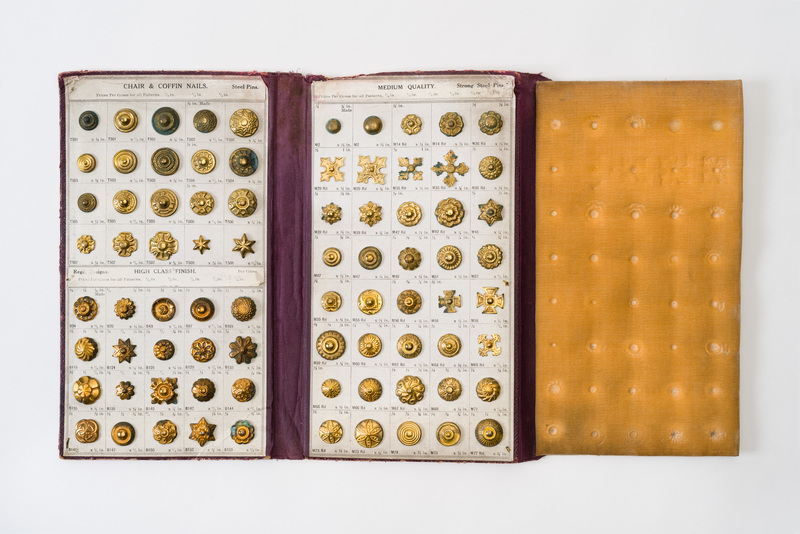 The screws they produced were decorative and designed for both coffins and chairs. The coffin furniture industry has always been closely linked to the cabinet and carpentry trades, and the brass fittings used were very often the same. The main function of a coffin screw was to secure the various structural elements of the coffin. Unlike conventional screws, coffin screws have decorative heads, in this case brass, but not exclusively so. They also came in a variety of cheaper base metals that were then plated with a brass or laquered finish. The decorative heads were designed to be exhibited (and admired) to make a visual impact. The decorative heads essentially conceal the core function of the coffin – disguising its crude function as a box that is nailed shut. Instead, it appears as a decorative object for the benefit of the onlooker. 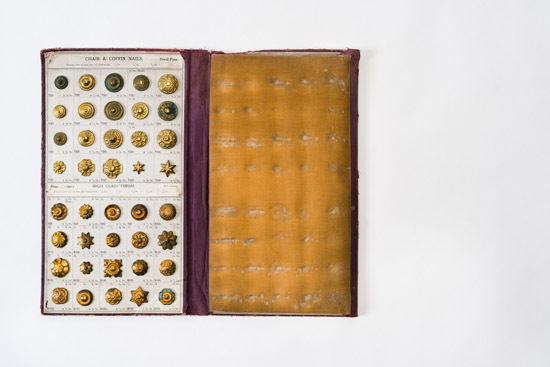 This sample book would have been used by a salesman at A J Harrison Ltd and it offered a range of nails of various qualities, including high-class finishes, most of which would have been Registered Designs and solid brass, and medium quality finishes, which were brass plated.